Sold by Outlet Promotions and Fulfilled by Amazon. Amazon's Choice for "family guy star wars"
Sold by Outlet Promotions and ships from Amazon Fulfillment. Sold by DealsPro and ships from Amazon Fulfillment. Clear some space for the third chapter of the funniest freakin’ trilogy in the galaxy! Once again, the Family Guy alliance travels far, far beyond the beyond the boundaries of good taste to bring you an outrageous sci-fi spoof filled with hilarious humor, adequate animation and a happy ending (giggity). So get ready to experience the lighter side of the Dark side with Peter Solo, Chris Skywalker, Princess Lois, Stewie Vader...and some surprising new faces. May the laughs be with you! 4.0 out of 5 starsIt's exactly what I expected. 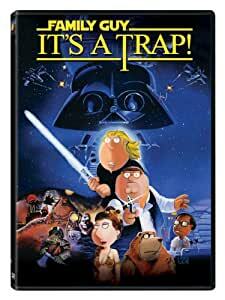 Like its basis, we come to the final chapter in the Family Guy Star Wars saga with 'It's A Trap'. The style of story telling and the humor is exactly the same there is really nothing different in this new installment that was expected. I have to call this conclusion one thing...'RESPECTABLE'. As a fan of this parody, you knew there was going to be nothing new. The same old Family Guy characters and jokes and pop culture references galore. The opening of the episode pretty much hit the nail on the head bashing itself about how it was only for the money and the executives made us do it. Some of the jokes like 'SSSDS' were right on target at the right moment and they just got a great belly laugh out of me. In the end i was satisfied and very glad they decided to make the whole trilory. Now I am going to sit back and patiently wait for the prequil trilogy, I mean let's face it they still have plenty of 'American Dad and 'Cleveland Show' characters to use. Seth MacFarlane's take on the original Star Wars trilogy a la Family Guy is complete, and while It's a Trap isn't as overly funny or quite as fun as Blue Harvest or Something, Something, Something, Darkside; it still manages to deliver the goods and end things on a high enough note. The events of Return of the Jedi are played out funny enough, with enough Family Guy characters (as well as charcters from American Dad and The Cleveland Show) popping up to help keep your attention. Between that and the hysterical ribbing on Seth Green, It's a Trap is a worthwhile and funny conclusion to the trilogy. The opening scroll foretelling the suckage of It's a Trap is only half-true: it doesn't have that same feel to it that made Blue Harvest so great, but it's funny enough in its own right to warrant your attention. 4.0 out of 5 starsOnly if you are a Family Guy fan. While I don't think this is as good as the first two Star Wars parodies/homages/whatever you want to call them, this is still pretty funny. The 'subtle glances' part (you'll know when you see it), still has me rolling around on the floor. Family guy can be crass, obnoxious, and basic in it's humor (which is why many like it), but this is also quite a loving homage to the Return of the Jedi. You won't see the film being trashed here, though you might see it being teased mercilessly. The writers obviously loved the film. So if you hate Family Guy, this probably won't convert you. If you love the show, this is essential. 3.0 out of 5 starsIt's a Let Down. After the first two,"Blue Harvest" and "Something Something Darkside", I was looking forward to this one. Boy was I disappointed. The scroll at the start of the film warned that this one was an afterthought and was only made because they were offered a car load of money. I should have taken them at their word. The jokes (?) came across as, at best, lame. More often they fell flat. The writing, such as it was, seemed limp and forced. If they thought that it was funny to keep winking at the viewer, as if to say "we told you we only did this one for the money", they missed the target by at least "a parsec". At least I have the whole set. But I cannot recommend this as being near as good as the first two. Sorry, but I just can't. Meh - so-so as far as family guy material goes. I'd really like to rate this 2.5 stars - i wont go so far as to say 'i dont like it (2 stars)' but i'm not sure i'd say 'its ok (3 stars)' either. For me, it kinda dragged on. I've had louder and longer laughs watching family guy episodes on tv then i had with this. At best, this one got a couple of weak chuckles out of me. Sadly, i don't think it's worth $20. Wait for it on netflix or tv. Sorry seth - but i just had to come back and change it to 2 stars. I was about to submit it with 3 stars because in general i like your stuff, but this one really was just kinda lame for me. 3.0 out of 5 starsWarning!! THIS IS NOT A DVD! (3 stars not because of Movie plot) THIS IS A TRAP!! Read this review for details!! This is sold as a "DVD" but, in fact, THIS IS NOT A PLAYABLE DVD!! When this "DVD" is inserted into DVD Player of an Apple Computer with the latest version of MAC OS, it DOES NOT APPEAR AS A DVD!! An icon appears on the Desktop Screen, icon looks like the Cover Art shown for this Title; BUT in that 'Window' that appears, are offered two Menu Choices: 1) to play 'Digital' Movie using 'iTunes' OR 2) to play 'Digital' Movie using 'DVD Player' --unfortunately, NEITHER OPTION WORKS!! BOTH choices create various error messages from whichever option you choose! Apparently, this movie is in some sort of Proprietary Digital Format on the 'DVD' that can NOT be played without running the "iTunes" or "DVD Player" applications that are also ON THAT DISK! Neither of which runs without crashing or generating a long 'Error Report' Neither program ever reaches a point where you could enter the 'Security Code' number found on the insert inside the "DVD" Case, to "unlock" the program. My speculation is, that MAYBE this Disk MIGHT play on the Version of MAC OS X in use when this Disk was released, back in 2010; which would be "Snow Leopard" --Apple has released at least SIX newer versions of their Operating System since this disk was first released, with each new OS Version incorperating numerous changes and alterations to the programs (iTunes or DVD Player) that this 'Digital' Copy of the Movie needs to run, such that this "Disk" will NOT RUN on current MAC Computer!! I even tried 3 different separate copies of this Disk, and they're all the same; they do not run on current MAC OS Computers! I have not had access to Windows PC to see if this DIsk would run on DVD Player attached to PC running 'Windows' Operating System. I am very annoyed at whichever company is responsible for marketing this Disk!!! I still have NOT been able to watch this Movie!! This item: Family Guy: It's A Trap!